Welcome to the Paper Makeup Stamps blog hop! You should have arrived at my blog from the super talented and Paper Makeup Stamps owner Katie Cotton's blog, if not, please start the hop at the PMS blog! Our blog hop theme for today is "Spring"!!! Products used on my card: PMS Sprout Fairy, MME dp, Bazzill and Neenah cs, Nestabilities, FP ribbon, Kaiser Pearls, Petaloo and Prima Flowers, CTMH buttons, DMC floss, Rock Candy Stickles, white Uniball Signo pen, machine stitching, Memento ink and Copic Markers. Inspiration for my card came from this week's challenge at Papertake Weekly, Sketch #149 from Sketch Saturday, challenge #63 at Paper Sundaes and the April challenge at One Crazy Stamper. Your next stop on the hop is Tangii! Paper Makeup Stamps is also having a HUGE annual inventory spring reduction sale so make sure you stop by the store after you are done hopping to pick up some great deals! Sprout has always been one of my favorites. Your stitching is just awesome!! She's just lovely Stephanie! And your stitching is AMAZING! A very very lovely card. It reminds me of those calico fabrics I love to look at in the fabric store! 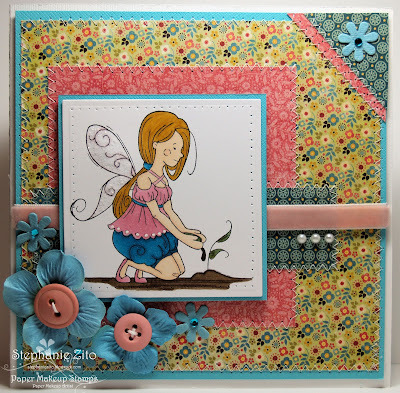 love the pretty colors you used on this card with sprout. Can you say WOW?! I absolutely love the papers you chose, and the SEWING is delicious!!!!!! Love everything you did on this, and it looks just so crisp and well-executed - I give it another WOW! Pretty card, Stephanie! Love the layout and your combination of papers! Very nice! You can sure make that sewing machine dance! And, I love your colouring, but you already know that! This is just beautiful. Love the dp and your sewing. The image is so cute and love your coloring. Love the buttons on top, they add a nice dimension to an already fab card! What a cute sprout fairy! I love your DP. Awesome and definitely springy! Love all of the stitching! Beautiful card,such a sweet image and a great take on the sketch...thanks for joining us this week at Sketch Saturday. i am a true believer that fairies help all things to grow...little children, adults who forgot to grow up and of course, plants. Beautiful card...love the mix of papers. this is so gorgeous. I really love the combo of papers. Thanks for joining us at One Crazy Stamper! so sweet! Thanks for playing the OCS challenge!